← Spring Flings: Sports Coats and Outerwear. Summer Clothes. Trends That Will Last. Dress Linen. 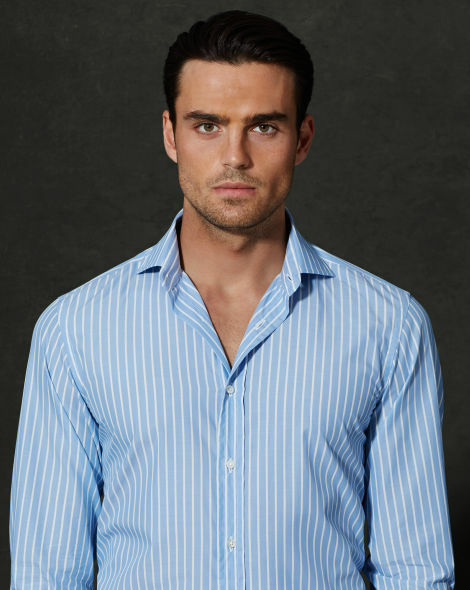 Ralph Lauren’s Purple Label Aston Linen Shirt. Click through for pricing. It’s hot here in Central Virginia. I’ve thrown out lots of rules in the last years. I wear seersucker and white before Memorial Day if the temperatures hit the upper 80’s F.
I also wear linen or linen/cotton/silk blends. Let me praise linen shirts, your baselayer defense in the face of the heat and humidity. The ancient Egyptians wore linen. And you can bet they knew a thing or two about heat, if not humidity. Most men shy away from linen because it wrinkles. That’s part of it’s charm. I believe that the wrinkles act like the weave in seersucker, making sure that only part of the fabric touches you at any one time. Live with them, especially if you’re casually dressed. But consider linen for dress shirts as well. They can be constructed just as formally as your cotton ones and work just as nicely with a tie. Or your khakis or jeans. Chambray is also big. Sports coats, trousers and shirts, but that’s for another post. This entry was posted in Elegantology and tagged linen dress shirts, Ralph Lauren, summer clothing, summer clothing trends. Bookmark the permalink. 2 Responses to Summer Clothes. Trends That Will Last. Dress Linen. You are so right, linen is one of the best fabrics for summer. I love to have it pressed smooth when it is cleaned, and then I wear it and don’t worry about the wrinkles. Stay cool! xo, N.
I’ve thrown several rules out the window myself since moving to Texas from Virginia last year. I WILL wear white after Labor Day. Temperatures will stay into the 90’s well into October – sometimes even November.